Bee in My Bonnet–AGAIN! | Lift Jesus' Cross! ← A Christmas Gift for You . . .
Do you remember this little bee? She’s trying to stir up trouble and pest us with heavy, distracting thoughts! This morning WordPress sent me an annual report on which blogs were the most popular/most read blogs from Lift Jesus’ Cross in 2014. The September post, Bee in my Bonnet, had the most reads! What’s funny is that last week I debated whether I should share an update on this “Bee in My Bonnet” saga. The day before Christmas Eve, my heart was heavy and discouraged. Of course, it’s winter in Pennsylvania so I was not able to go outside to take time with the Lord there. Still, our God is so merciful and tender. I was hit with a series of disappointments. My husband underwent a series of tests for the last six months only to discover he was infected with Lyme disease twice–once he had Lyme meningitis and the hospital didn’t see it. As a result, he was left with permanent scarring on his brain and debilitating headaches, sometimes with double vision. (For those of you not familiar with this disease, it is becoming widespread in Pennsylvania and is carried to humans by a tick bite. Ticks populate our wooded areas). I was also diagnosed with a debilitating disease this year. A book project that I worked on for months, invested gobs of time and money into it, just fell apart this month. We have a young adult child that is running from God (let’s just say I’ve read Franklin Graham’s book Rebel With a Cause and gleaned much there). And two days before Christmas, I received a notice from the IRS that 2013 taxes were not calculated properly and I owe them more than $2,100 plus fees! Maybe there was more than one bee in my bonnet . . .
Get rid of the bee in your bonnet–put on the helmet of HOPE! But let us who are of the day be sober, putting on the breastplate of faith and love, and as a helmet the hope of salvation. For God did not appoint us to wrath, but to obtain salvation through our Lord Jesus Christ (I Thessalonians 5:8,9). Despite all the discouraging news, I had to smile. I was being given “orders from heaven’s headquarters” to put on that helmet again. THE BEE IN MY BONNET story continued. After working for hours on Christmas preparations that same day, I decided to lie down on the couch. I picked up the pillows to arrange them so I could rest my head. A YELLOW JACKET BEE WAS CRAWLING AROUND ON MY PILLOW!! I’m not joking! It’s December and we NEVER get yellow jackets in the freezing cold days of December. I was stunned! I took the pillow to the door and tried to blow it off. It clung to the pillow. I tried to swipe it off. It clung to the pillow. I took off my shoe and swatted that bee off the pillow and it finally fell to the porch outside the door. Sorry–I didn’t even think to take a picture of it. Honestly, I was still in a bit of a “funk” from all that was going on. Here’s the lesson. The very place where I was to lay my HEAD had a bee crawling around on it. My place of rest had a STING awaiting me. Now, that will teach me to wear the helmet of salvation! There are several readers of this blog who emailed me or called me to encourage me. Most of them had no idea I was in a series of trials, but God touched their hearts to send me a word to lift my spirits. My thanks to Larry, Marlene, Ron and his wife, Jean, BillieJo, Carol, and Jo. We need each other, don’t we? Many of us enjoyed beautiful times with friends and family over Christmas. We look forward to similar joys in the days ahead as 2014 comes to a close. But there are others who are hurting. My sister told me of a man whose house caught fire and he lost his infant daughter the week of Christmas. She said the man sat on his front lawn, pulling the hair out of his head, in deepest sorrow. This is a dismal picture of our need to protect our minds, our thoughts, in the days to come. Our HEAD needs to be protected and guarded. The annual report for Lift Jesus’ Cross shows we have had more than 18,000 reads from 130 countries. To each and every person reading this blog, know that I care about you and Jesus sees your wins and losses from 2014. He knows all the tender spots and he holds out his armor to you in this coming year. Please–put on the helmet of the HOPE of SALVATION as you leave 2014 and enter 2015. And if you need prayer, don’t hesitate to email me at seehope at Comcast dot net. I care. Happy HELMET to your New Year! 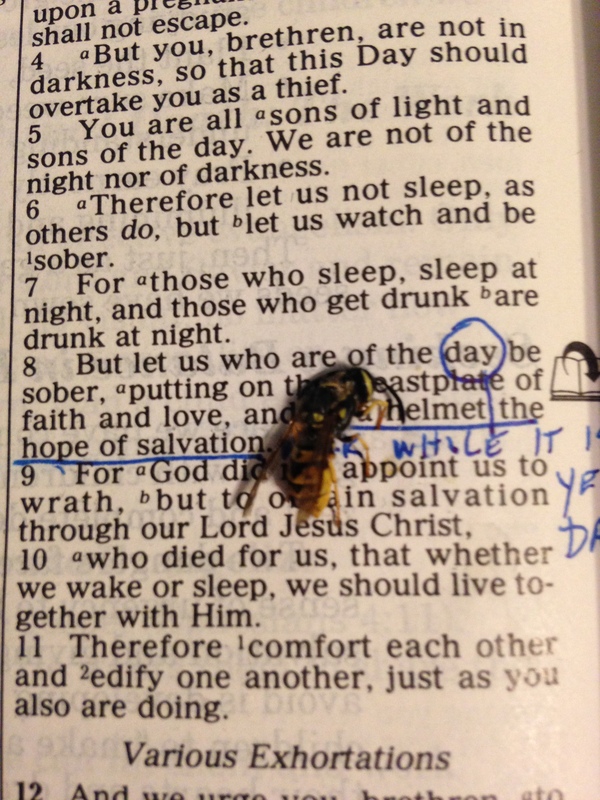 This entry was posted in The Cross and the Christian and tagged armor of God, bee in my bonnet, Happy New Year, helmet of salvation, helmet of the hope of salvation, New Year, New Year 2015, pray for me, prayer, Thessalonians 5, thoughts, yellow jacket. Bookmark the permalink. 15 Responses to Bee in My Bonnet–AGAIN! Like the Apostle Paul, when we are in the midst of long trials, we may not look or feel like pillars of faith, but even then, we can believe in the God who raises the dead. Our dead dreams. Our dead prophecies. Our dead ministries. Our so-called dead family members, not serving God. And so forth. Paul survived his trial and went on to write eight more books, including Ephesians and Colossians. If God did that for Paul, He will do it for each of us, too. Larry, are there characters in your new book that think like Paul? Or shall I say they think like you? I remember when I mourned the death of the children killed for their faith in Jesus in Iraq a few weeks ago, you reminded me that Revelation says that a number will be fulfilled of those martyred for Christ before His return. We could use a book that helps us sift through things from a Biblical perspective. No one can doubt we are in the end times. Preach it, Larry! Awesome word! Great post. Wear the helmet well! Rebekah, I’m sure God has a runner’s helmet that fits you perfectly! I hope you get some nice days this winter to take off on your runs. Wow girl! May the Lord give answers from His storehouse for you! Be blessed in many ways, as you proceed into 2015, trusting Jesus all the way. May the healing balm of Gilead be yours, as well as your husband’s. Thankfully, the Lord is aware of every small need we have, and He has answers for us that will astound us! Thanks, Jean. You had no idea how encouraging you were a couple weeks ago when you asked me about my blog. It looked like I fell off the blog circle, I’m sure. God bless you. Love you, too. Awesome word, Hope!! i was just reminded to day to fix my eyes on Jesus, who is the author and finisher of our faith!!! Yes, that’s a good word, Carol. I picture the cloud of witnesses watching us right there with Jesus, cheering us on to the finisher’s finish line. FAITH!!!!! Without faith, it’s impossible to please him. We MUST believe that He is God and he rewards those who seek Him diligently. Love this. I’ll stop. Ready to blog again! Wonderful Holy Spirit does this beautiful work in whispering to our hearts, day in and day out. Billie Jo, I don’t know how he withstands all the corruption in our world, but I love Him for staying with us and helping and healing as He goes heart to heart, flower to precious flower, “pollinating” each one of us at our core. Glory! Wonderful reminder, Hope. Hang on to Jesus . . . and hang on to your hat (be it a bonnet or the helmet of salvation). Thanks, Jo. What a blessing you are to me and to Voice of Hope Radio to China. God will supply . . .
Oh girl this is so timely. My heart aches for you as a mom . As you know I am dealing . With the same deal although my health is ok. So is johns. Stress. Too much to bear. Sometimes I look at the cross and wish it were me. Then it is done. You are a wonderful momma…I know…ive seen from the beginning. Ill be praying for you. We need to get together. Lets make a date after you read this! Love you, Diney! Thanks for your encouragement. I’ll pray for you and Johnny and yes get together soon. If anyone wants to pray over the phone or email contact me. Email is above. We can join hands as we worship God and wade into the new waters of 2015. I tell you truly–another wave of revival is coming. In OUR GENERATION.